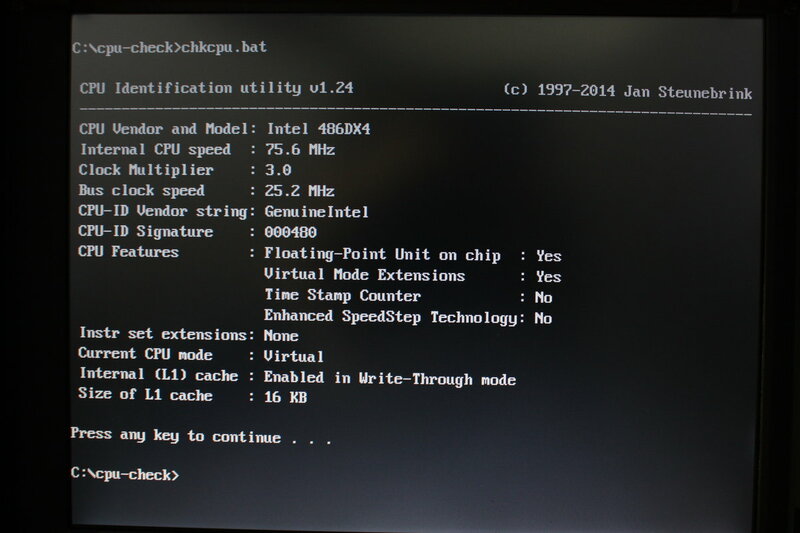 This blogpost shows you my recent overclocking experiments with the venerable Thinkpad 701 - a laptop from 1995 which has even made it to the MoMA collection. Why? 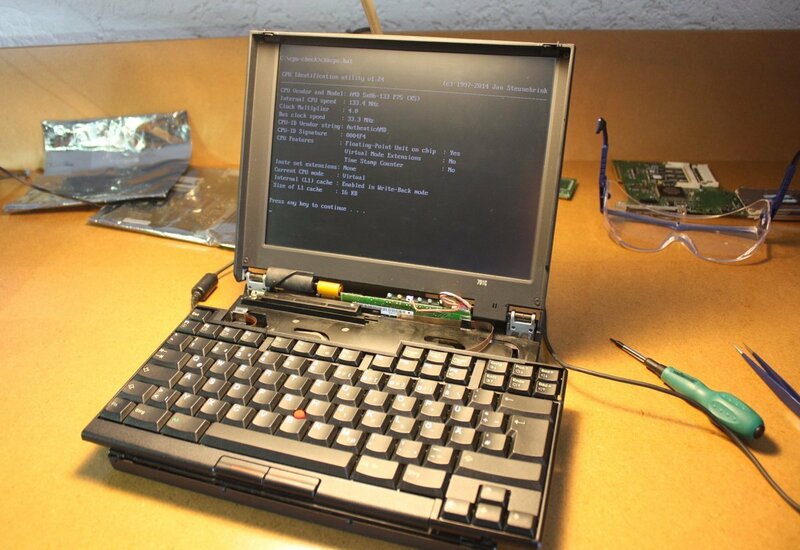 Well, when it came out, the 701 was not only one of the first subnotebooks around, it was also the first subnotebook to feature a full-sized standard keyboard at the same time (and it still remains to be the only one btw). The engineers at IBM achieved this with an ingenious slide-mechanism which folded the keyboard together when the laptop lid was closed and they called their invention the "TrackWrite" keyboard. 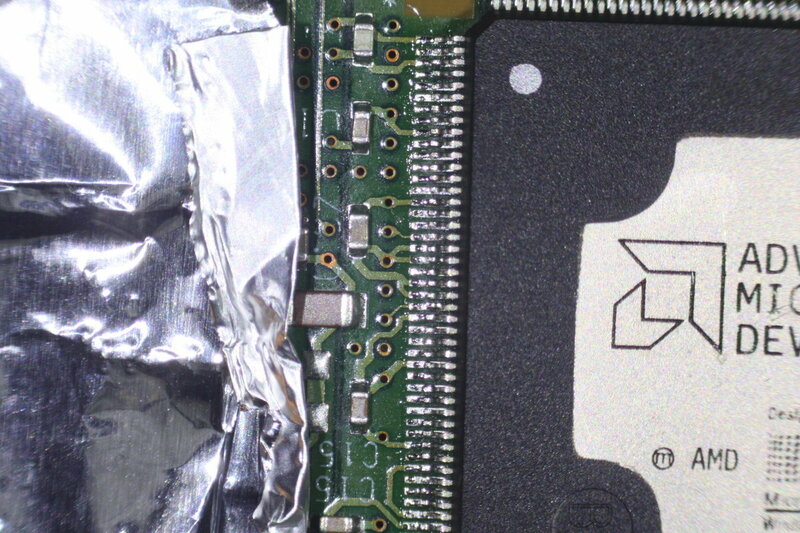 For its similarity with the folding of butterfly wings, the 701 became known as the Thinkpad butterfly. 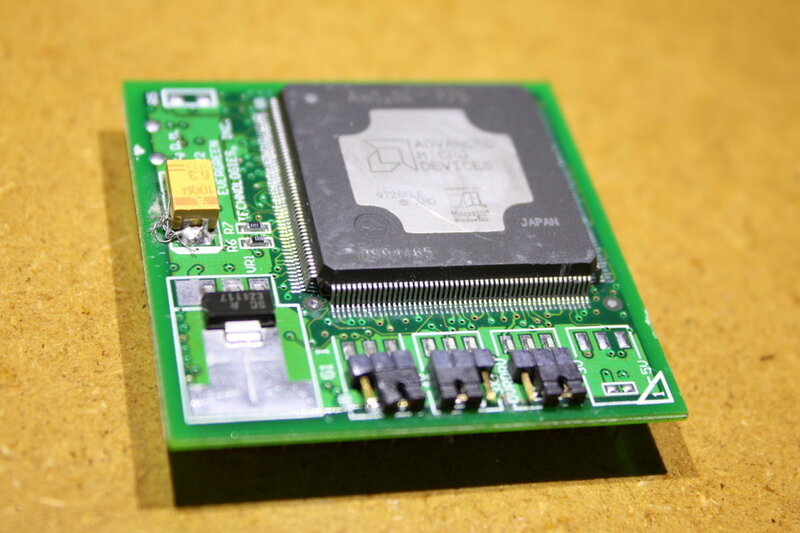 With the system´s original bus clock frequency set to 25 MHz, the 701 was either available with an Intel 486-DX2 which doubled this base frequency to 50 MHz, or with an Intel 486-DX4 which - against what the four in DX4 might suggest - only trippled it to 75 MHz. 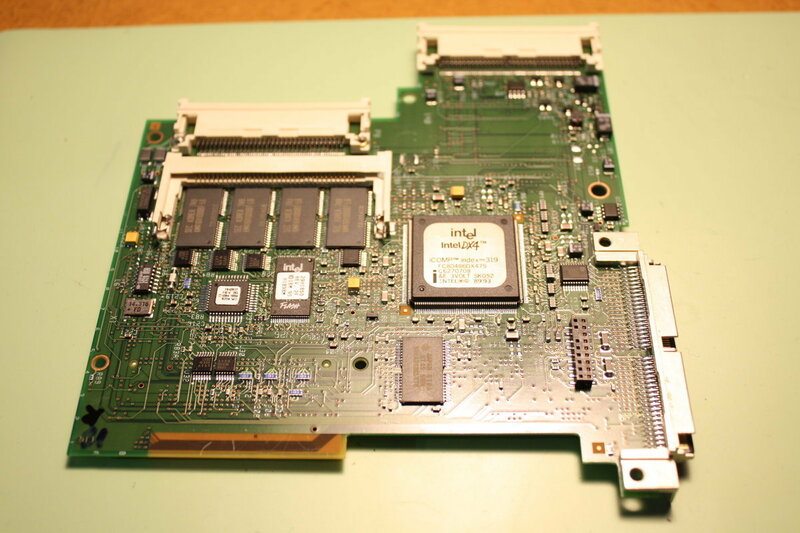 However, there was yet another inofficial configuration back then - the butterfly powered by a 133 MHz AM-5x86 CPU. It was a third-party modification which was offered by some specialized shops, e.g. by "Hantz & Partner" (at least according to the info from this thread). As for benchmarks, I recommend to read through the extensive X5 CPU comparisons conducted by David A. Ross on his webpage. 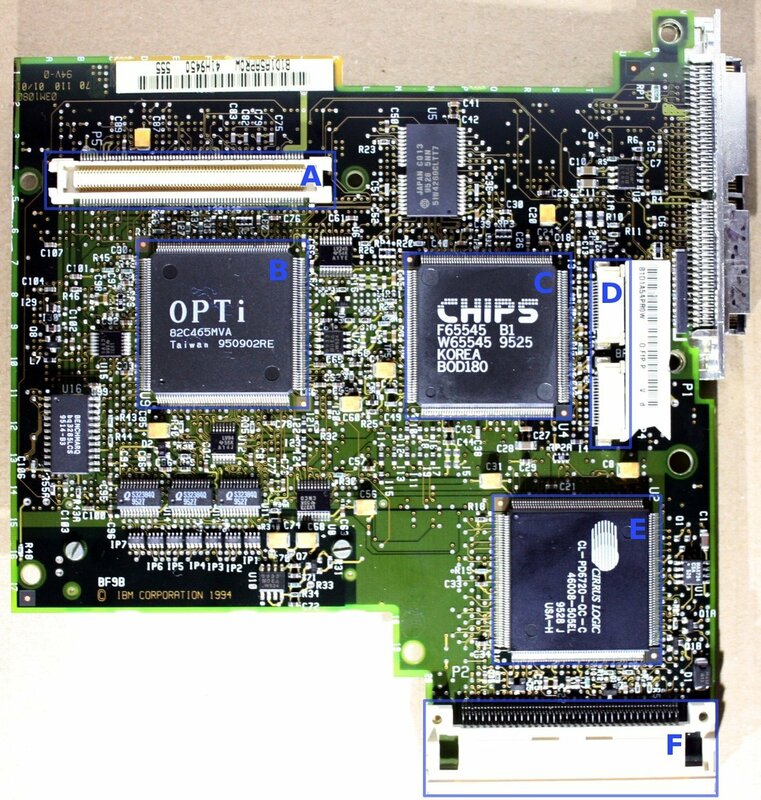 The butterfly had two mainboards which acted as a single unit when connected together. 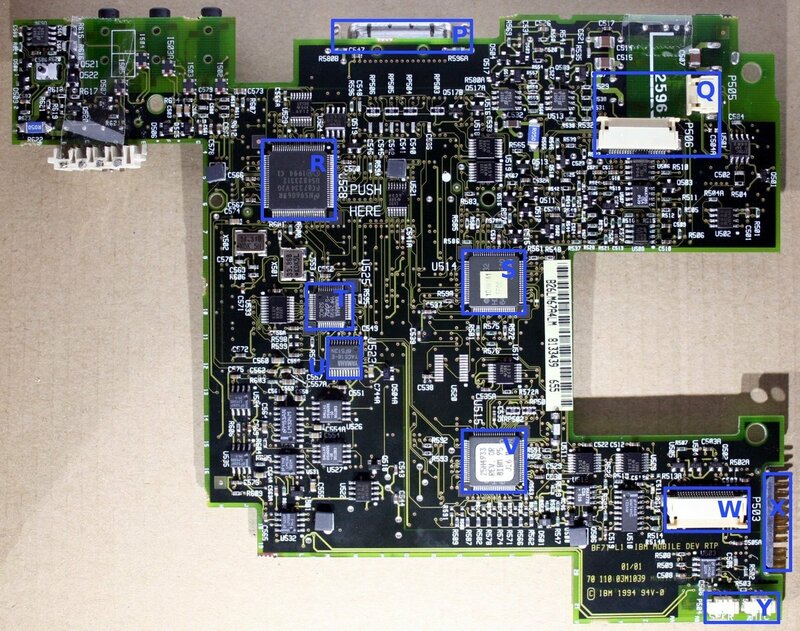 As I have not found too much info about them I present some hardware details in the following paragraphs. In the (D)X5 the system clock is multiplied - no, not with five - but with four: 25.1 MHz * 4 -> 100.4 MHz in case of the butterfly. 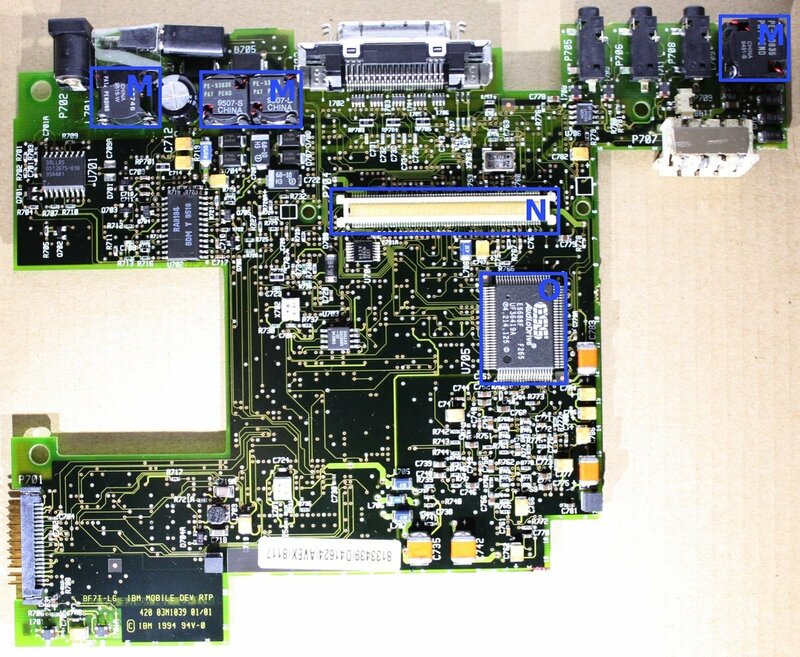 To get the full 133.3 MHz out of it requires to raise the bus clock speed from 25.1 to 33.3 MHz: 33.3 MHz * 4 -> 133.3 MHz. Okay - it worked - 100.4 Mhz. 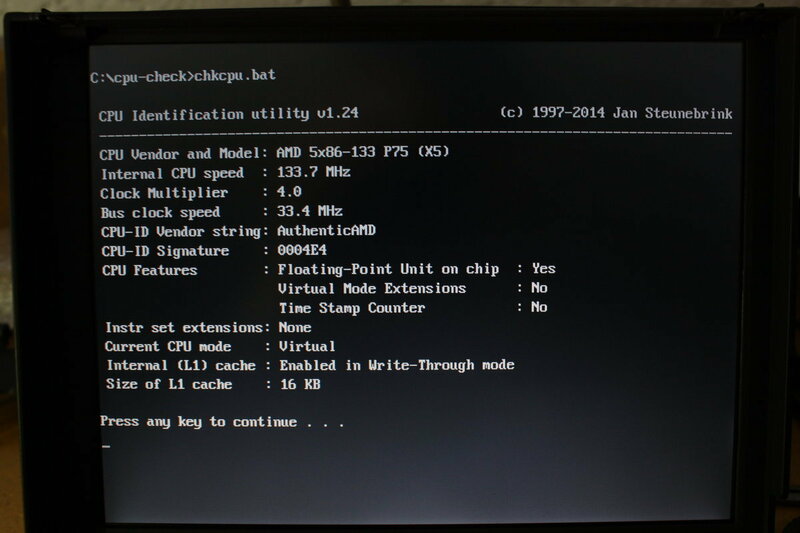 The overclocked DX4 works but gives "incorrect opcode" errors from time to time. As the original DX4 is not even intended to work on this frequency, I decided to continue with the AMx586. 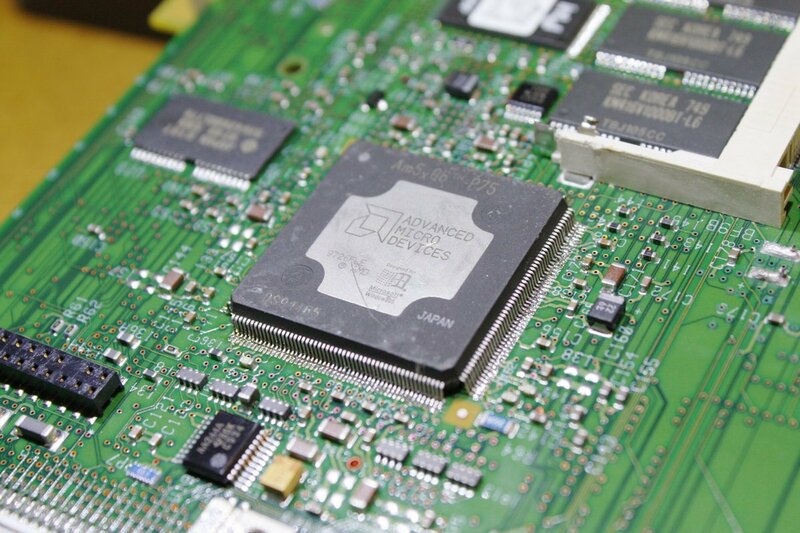 The X5 is a low-power chip which uses a core voltage of 3.3 volts instead of the 5 volts used by 80486 desktop CPUs. 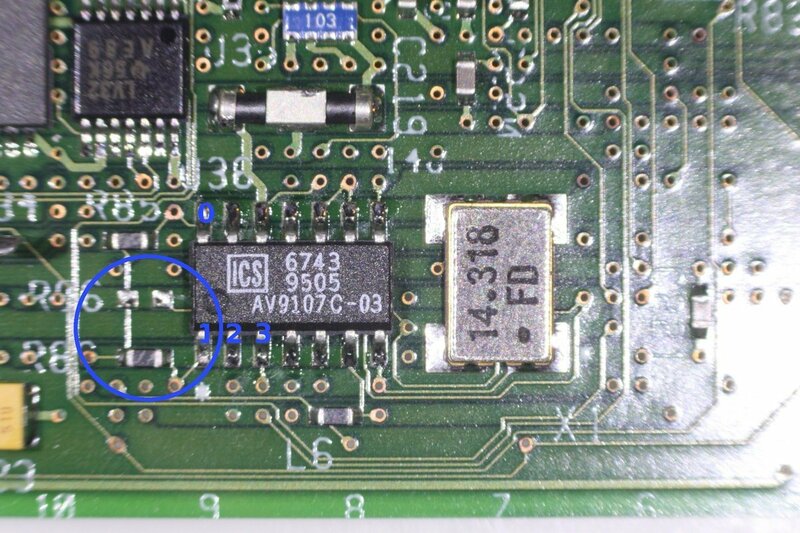 Luckily the original DX4 is also powered by 3.3 volts and the pinout is more or less identical. 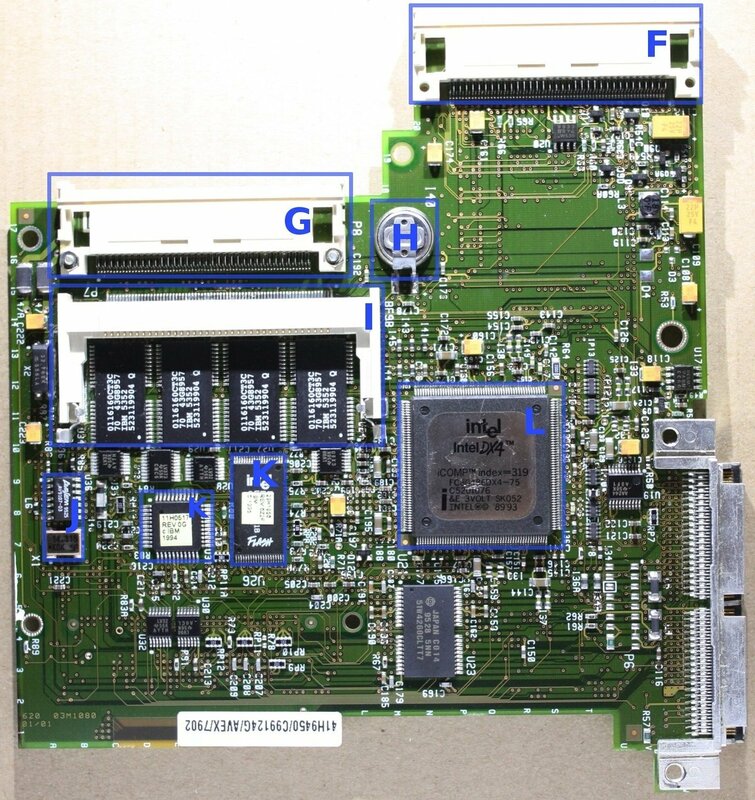 This makes it unlikely that the 5x86 will get fried when used on the board. 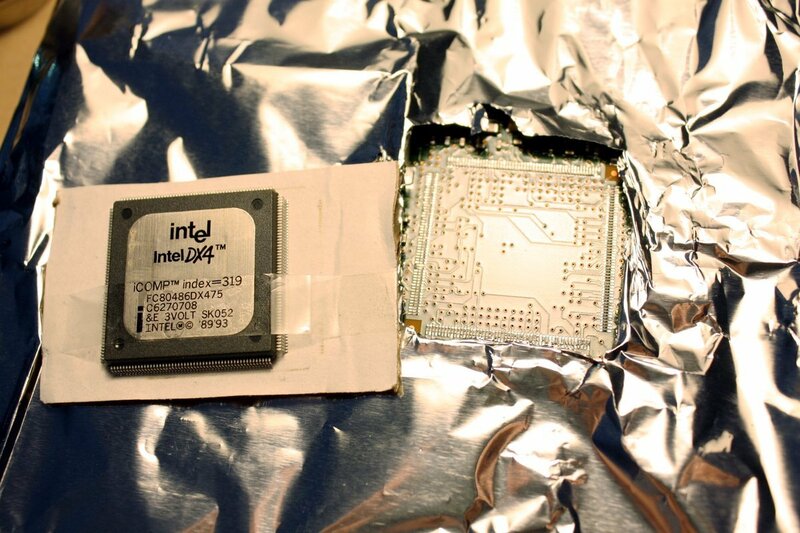 To prevent damages from excessive heat during the removal of the old chip, I wrapped the board with aluminum foil. 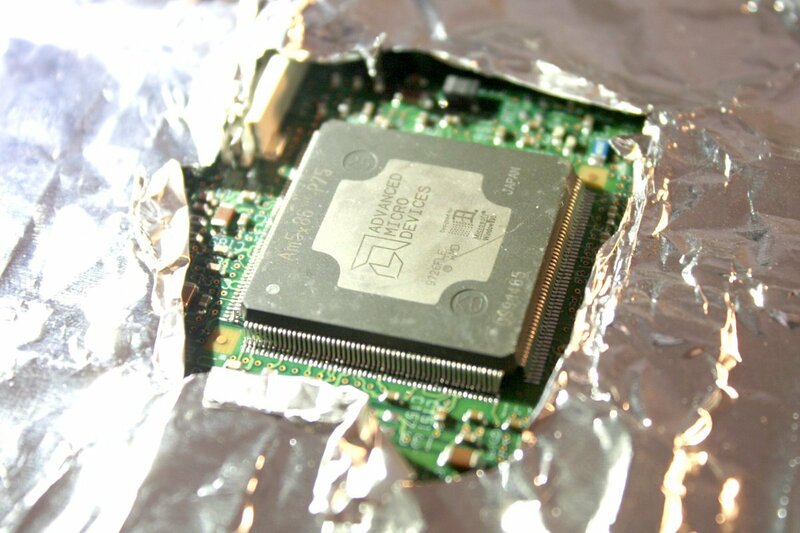 With a stream of hot air I heated the chip up until the solder became fluid. Then I could lift the DX4 carefully up and put it away. 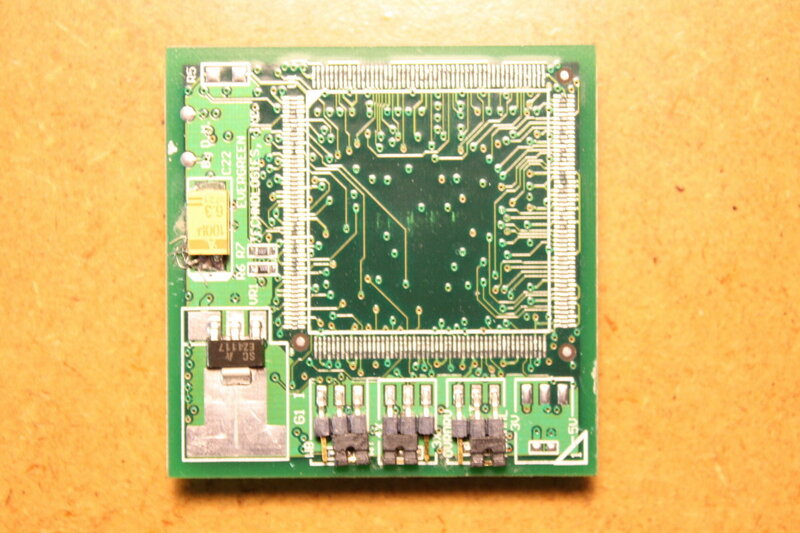 Afterwards, I cleaned the solder points on the board and put a fine amount of new solder to them. 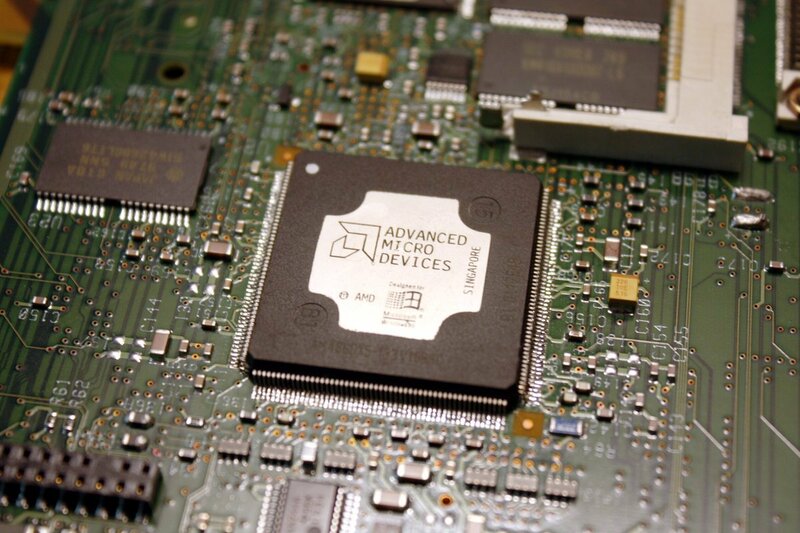 The first one was an unused AM486DX5-133V16BHC made for embedded x86-based applications. 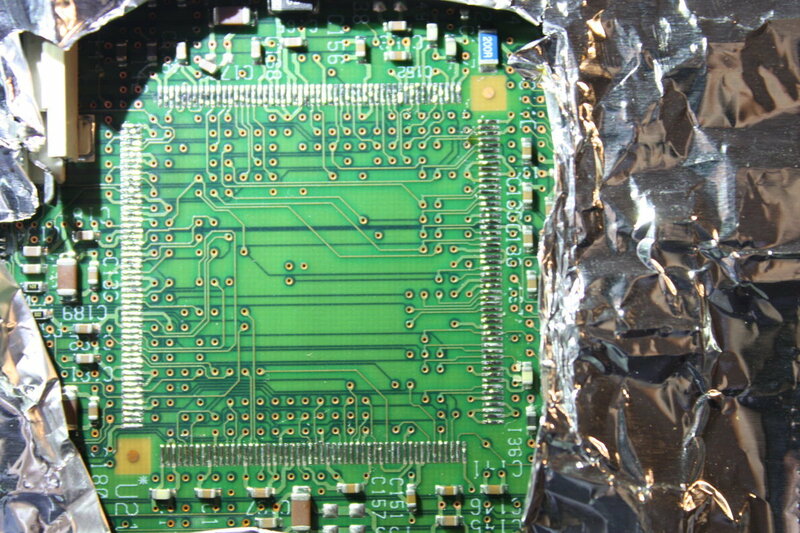 The second one was soldered to an Evergreen 168-pin module. Now I could align it on the butterfly board. 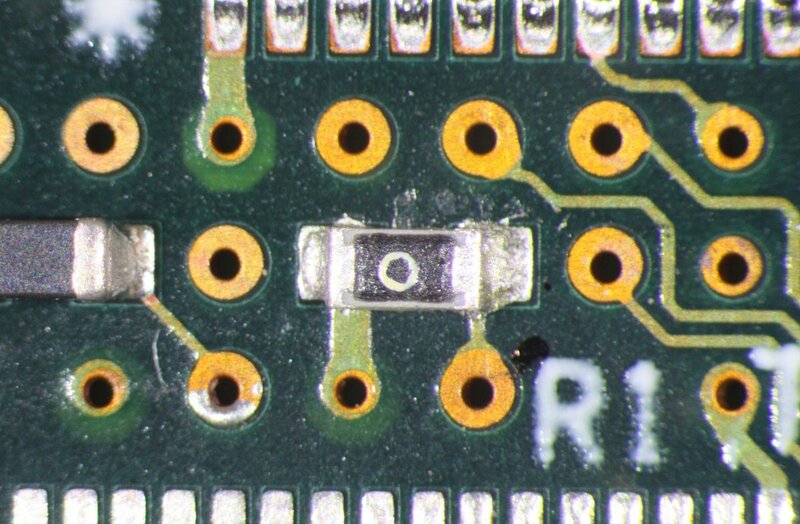 With a fine tip on my soldering iron I resoldered the pins and checked the solder joints under the microscope (this photo was taken from the AM486DX5-133V16BHC which I soldered to another board). 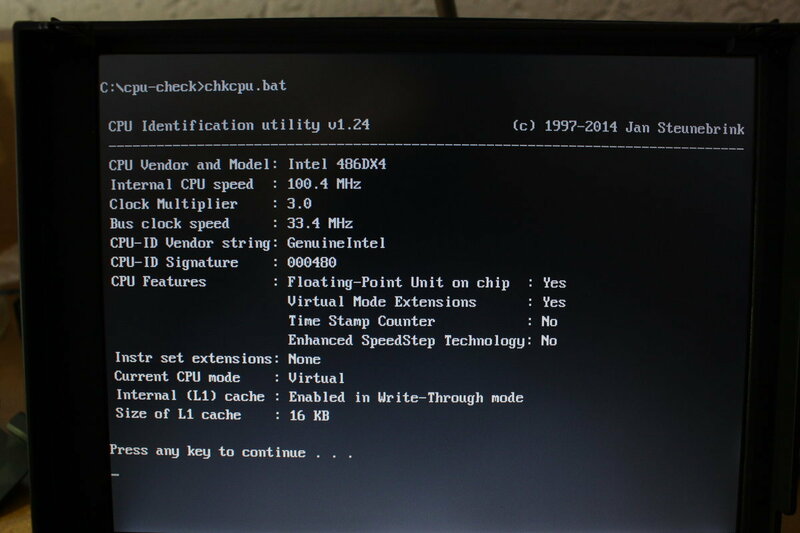 I still had to raise the multiplier and bus clock speed. As for the latter I did it like described above. 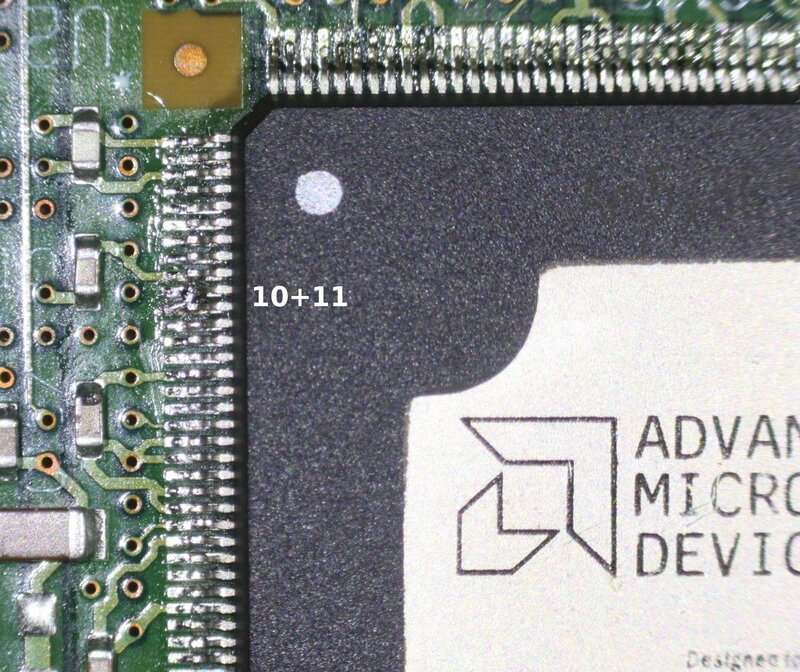 Again alldatasheet.com helped me on by providing a datasheet for the Am5x86 microprocessor. 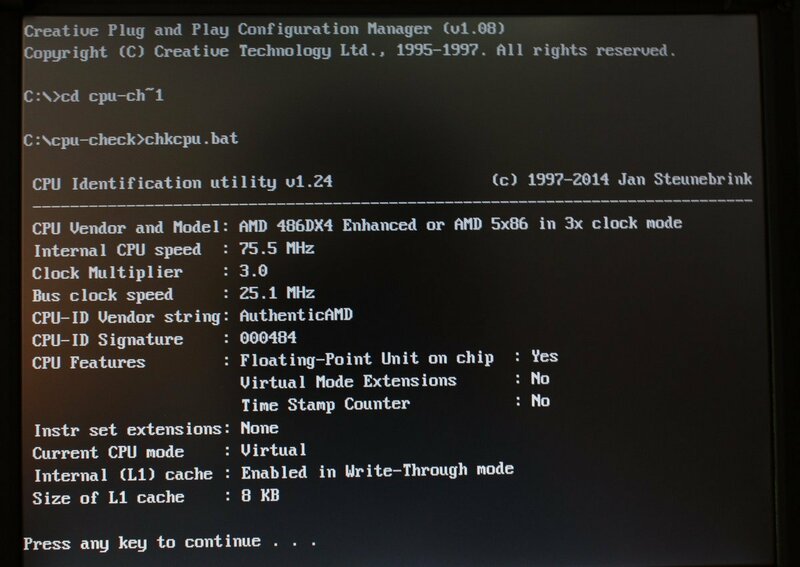 The tag "CLKMUL" gave me an important hint: "For 133-MHz processors, [CLKMUL] must always be connected to VSS [i.e. has to to be grounded] to ensure correct operation." 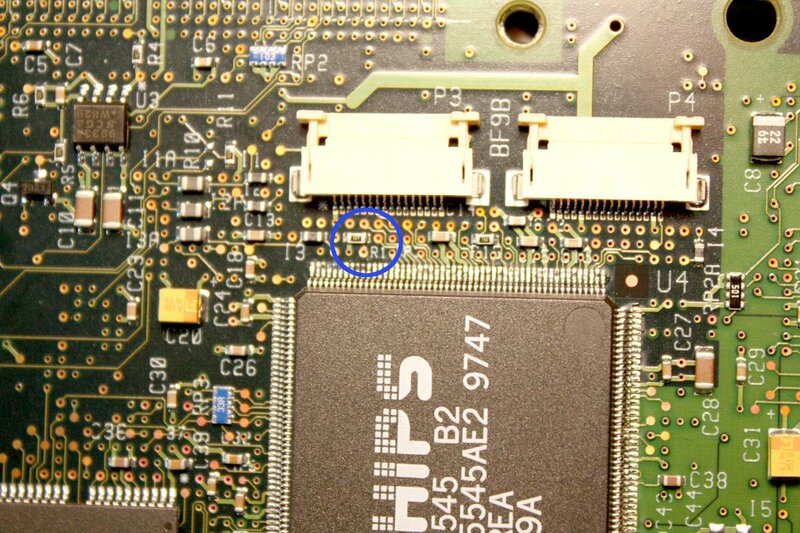 - that means bridge CPU-pins 10 and 11 to get a 4.0-multiplier (I later verified this by inspecting the pins on the Evergreen module and it showed that the 4x mode was activated with a jumper which did just the same). Great, everything worked out as exspected. 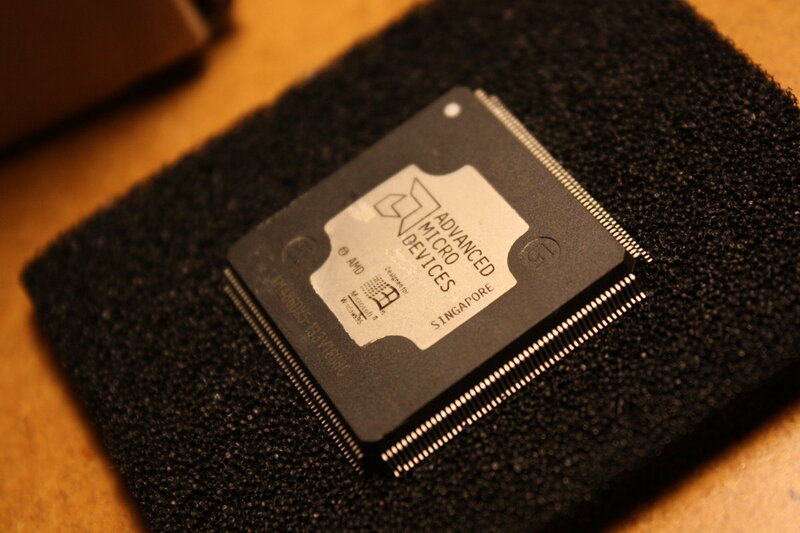 As the X5 has an internal 16K write-back cache, next step will be to get it activated. 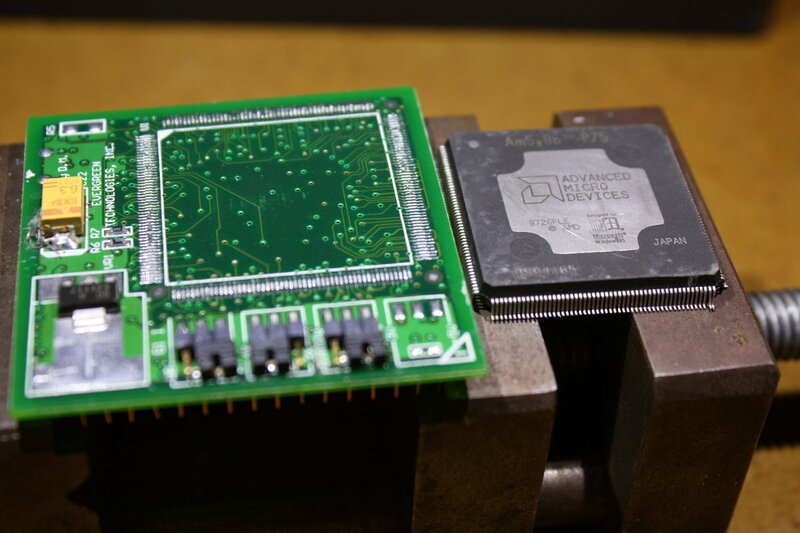 Again, the datasheet for the Am5x86 microprocessor delivered the answer: "If the processor samples [pin 64 tagged "WB/WT"] High at RESET, the processor is configured in Write-back mode". 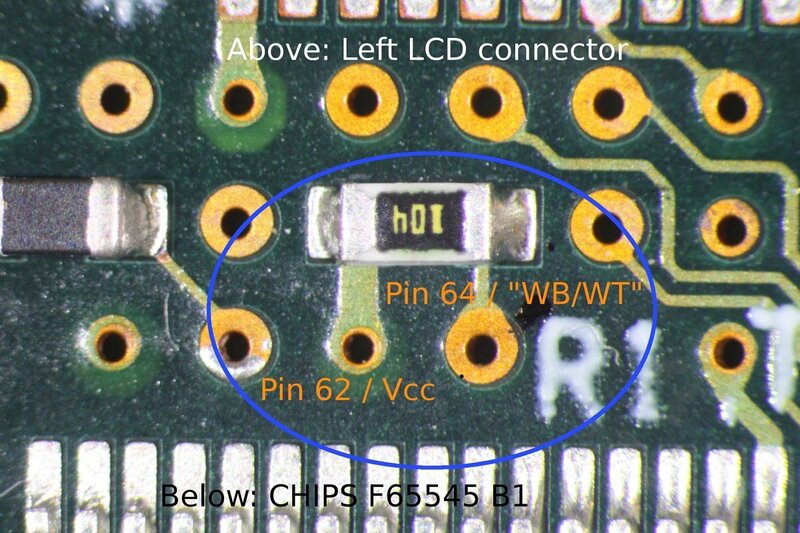 To get it "High", I looked for the easiest way to connect pin 64 to a Vcc pin. 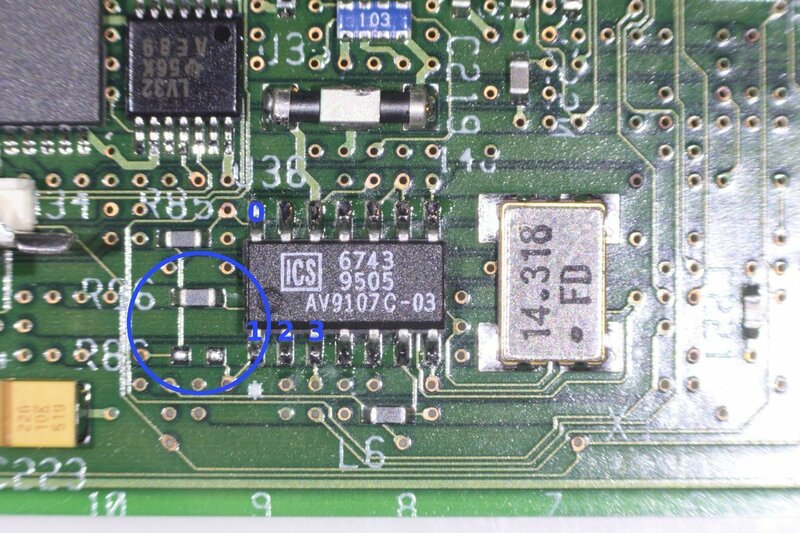 I determined pin 62 to be the closest one and interestingly R1 - a 100k resistor located on the other side of the mainboard - already connected pin 64 to pin 62. I thus replaced the 100k with a zero-ohm-resistor as seen on the following picture.